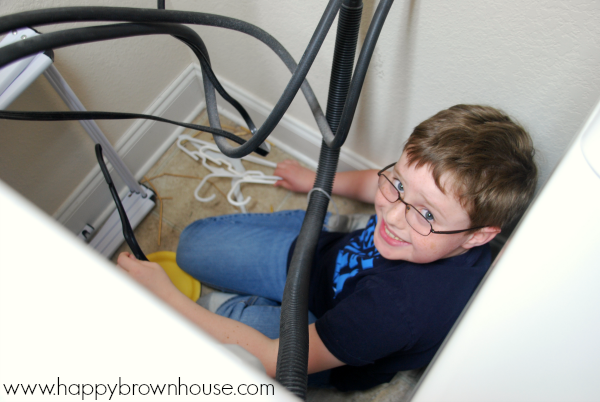 Spring Cleaning time is here, and like other moms, I’m in full purge and spring clean mode. After winter, I’m ready for a fresh start and reset to begin the spring season and take us right on into summer. 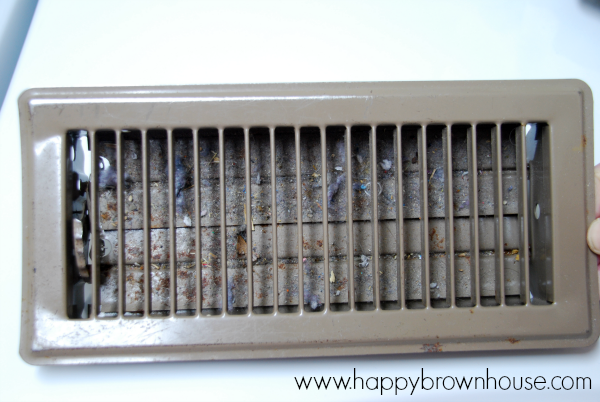 While I’d love to roll up my sleeves and dig right on in to the dust and dirt that has accumulated in our home, my cleaning supplies and laundry room is the place that seems to be my dirty little secret. 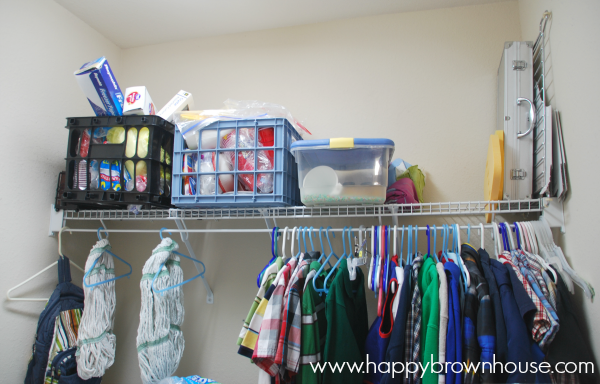 Our laundry room serves as a multi-purpose room–part laundry room and part the drop-off zone for coats, shoes, and my purse. Then, it’s also the place that things get shoved into when company is coming and I’m short on cleaning time. Needless to say, that is where my spring cleaning needed to start. 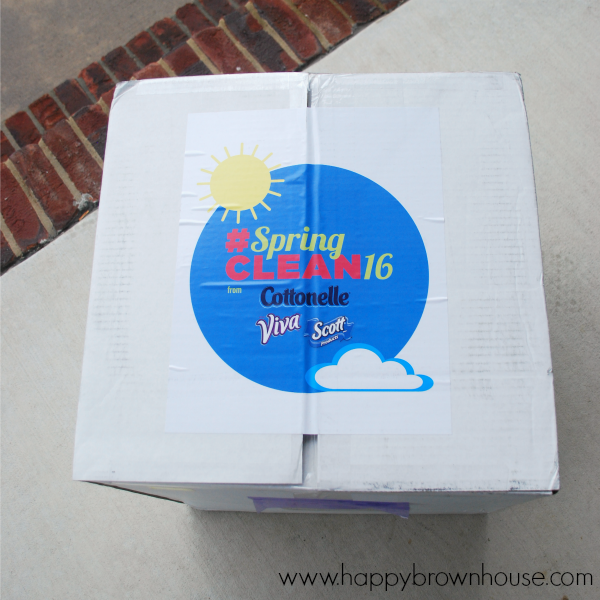 The kind folks at Kimberly-Clark sent me a big box full of things to try to get my #SpringClean16 off to a great start and I was so surprised with the contents! 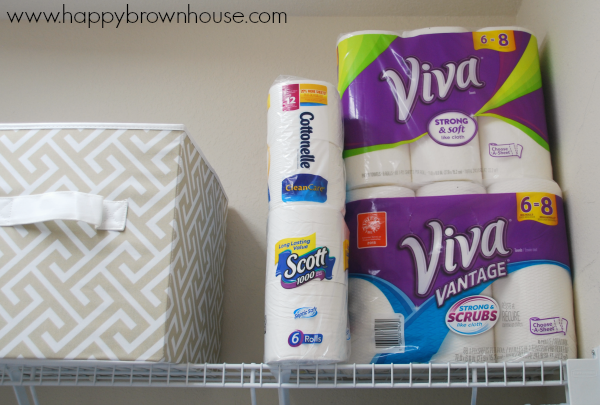 There was a beautiful big basket, a paper towel holder, a cleaning caddy, a spray bottle, and some of their products to try–Viva® Big Roll Paper Towels, Viva® Vantage® Paper Towels, Cottonelle® Toilet Paper Double Rolls, and Scott® 1000 Bathroom Tissue. 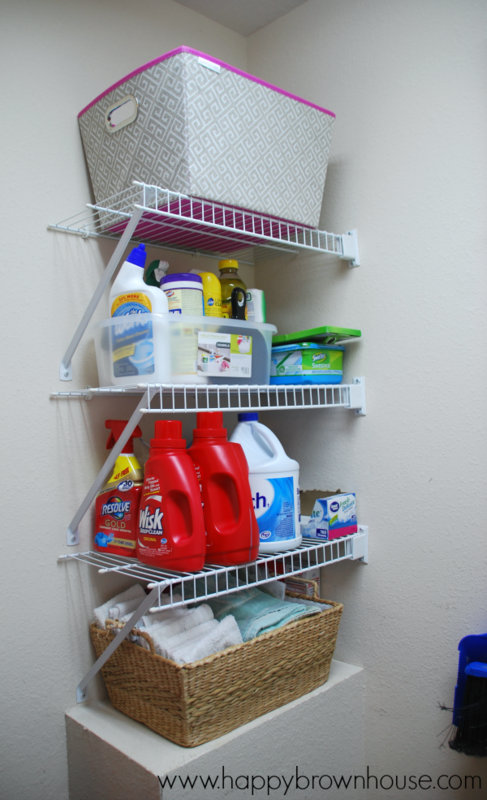 When I was asked to write about spring cleaning and organizing, I knew immediately that I needed to get my laundry room in shape first before I could even begin to do the deep spring cleaning that I do every year. My laundry room was a mess, my cleaning supplies were a mess, and the overflow of stuff that never made it to their permanent homes were everywhere. 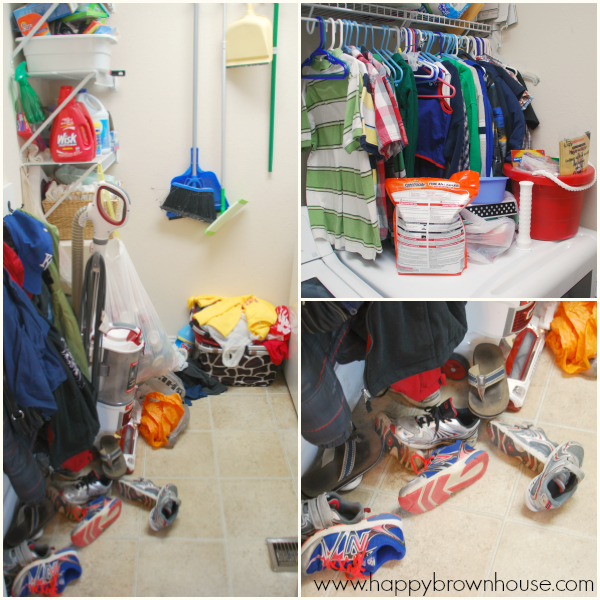 Here’s a glimpse of my laundry room before I started the great clean and purge. First, I took everything out of the laundry room floor and all of the items sitting on the dryer out of the laundry room to give myself space to work. Then, I started with my cleaning supplies. I consolidated some of the cleaning supplies into the half empty bottles, tossed the empty ones that never made it to the trash and took stock of what I needed to purchase at the store to do my spring cleaning. Here is the before–a big mess and hodge podge of cleaning supplies that needed to be tamed. 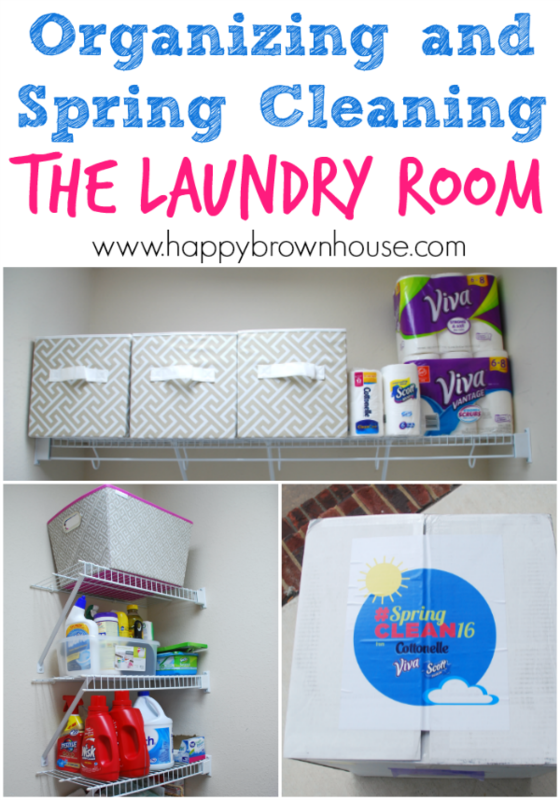 I’m happy to report that I was able to corral all that mess into a cleaning caddy with only a few overflow items that I put in a cute basket (included in my #SpringClean16 box) at the top. 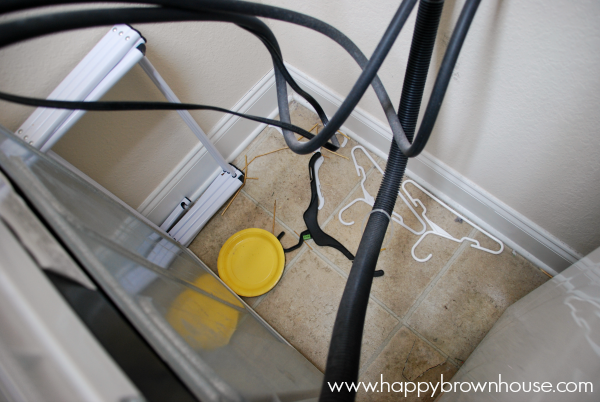 I’ll use the cleaning caddy as I work my way around the house tackling the bigger spring cleaning jobs and the normal weekly cleaning jobs, too. Here’s a picture of the results of that cleaning supply purge. Next, I turned around to tackle the shelving above our washer and dryer. It’s where I store my paper goods for parties, toilet paper, paper towels, and a few other miscellaneous things, like our colored rice sensory bin. I also had some clothing hanging from my youngest that somehow never made it to the 3T box when I was switching out clothing…last year. 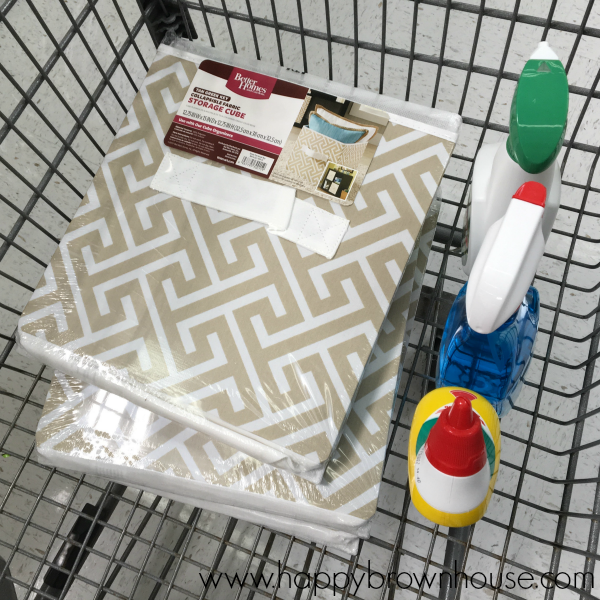 While I was at Walmart, I spotted some collapsible fabric bins that were a similar pattern to the large basket I received in my #SpringClean16 box and knew they would be perfect for replacing the ugly plastic crates that we were currently using. I consolidated our party supplies and paper goods into those pretty bins and I couldn’t be happier! Now all of those things are tucked away in an eye-pleasing way. 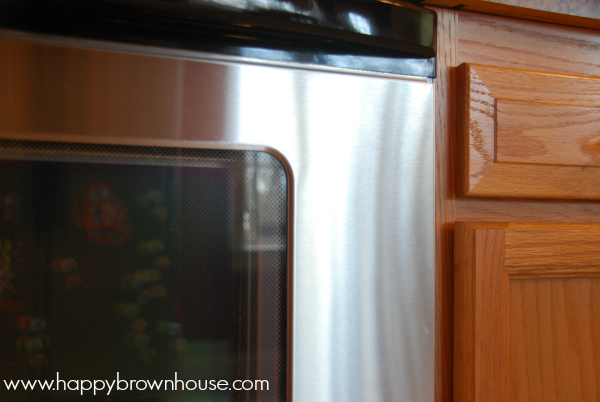 My husband likes this fact the most because I had been begging for cabinets to hide all the mess–now we don’t need them! I plan on making tags for the baskets so I know where everything is soon. After that, we got down to the actual deep spring cleaning of our laundry room. I had my husband move the washer out so we could get all the hangers that had fallen behind and to vacuum up some lint from the dryer. It was a mess behind there. 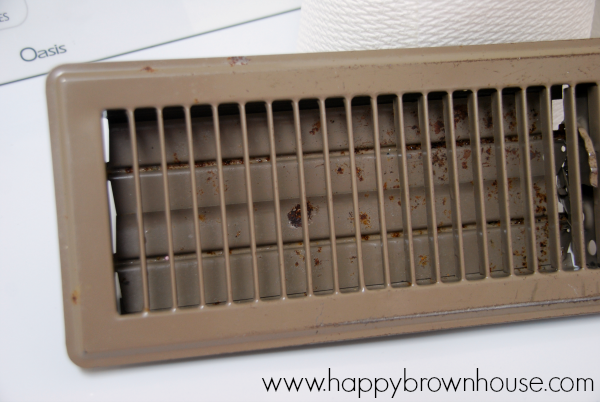 My husband took the air conditioner vent that we keep closed in the laundry room (why our builder put it directly in front of the dryer, I’ll never know) and cleaned it with a Viva® Vantage® paper towel–they have a scrubby texture, like terrycloth and are great for grimy surfaces. While he couldn’t do anything about the rust spots, it looked much better! 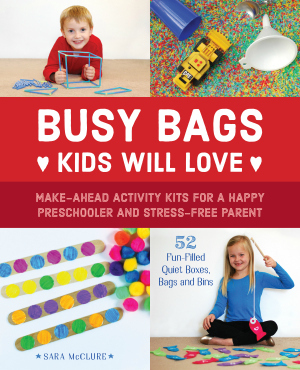 The remainder of the time, we placed only what needed to be returned to the laundry room to its place–light jackets, not the heavy ones that had been taking up space, my purse hanging on the hooks we have mounted on the wall, and the kids’ shoes neatly lined up under the hooks. Our laundry room was starting to take shape! To the shelves, I added our Viva® Big Roll Paper Towels, Viva® Vantage® Paper Towels, Cottonelle® Toilet Paper Double Rolls (I’ll place this in the bathroom where I’m still wiping a certain little bum), and our Scott® 1000 Bathroom Tissue (I’ll place this in the bathroom that it needs to last the longest because someone, whom shall remain nameless, still uses too much toilet paper). Once the laundry room was done, I wanted to see what the Viva® Vantage® paper towels could do for my stainless steel appliances. 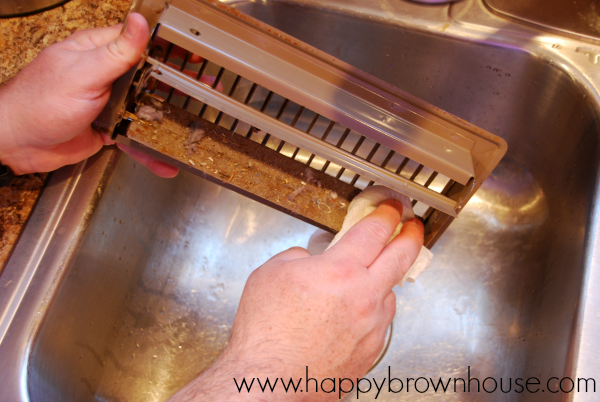 I had heard that the scrubby texture, like a terry cloth was perfect for getting the stainless steel appliances to shine. 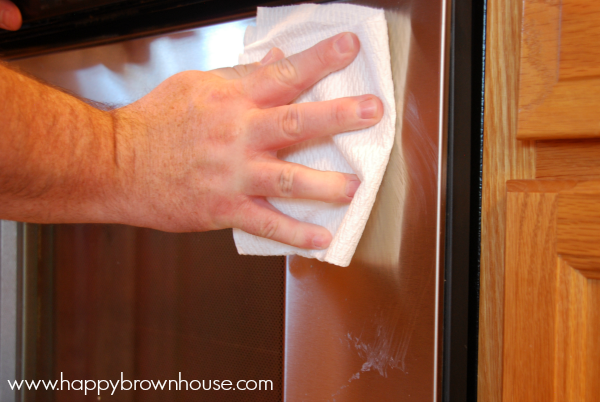 I am forever trying to wage the war between little finger prints and my stainless steel surfaces. See what I mean? 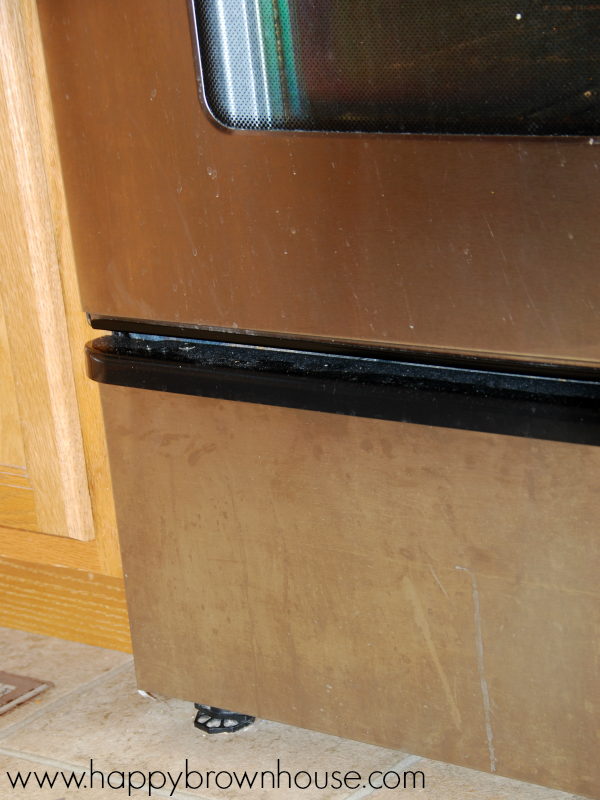 My husband was nice enough to help me clean the front of the oven while I tackled the dishwasher and the refrigerator. By the time we were done, they were shining like new. 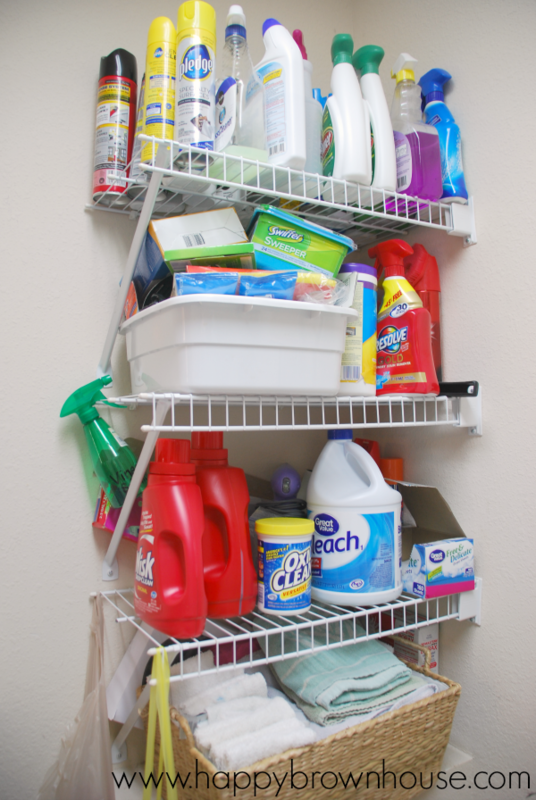 Now that our laundry room and my cleaning supplies are all organized and ready, I can get started with my real, deep spring cleaning around the rest of the house! Next in line is the boys’ bedroom with a new coat of paint, too. 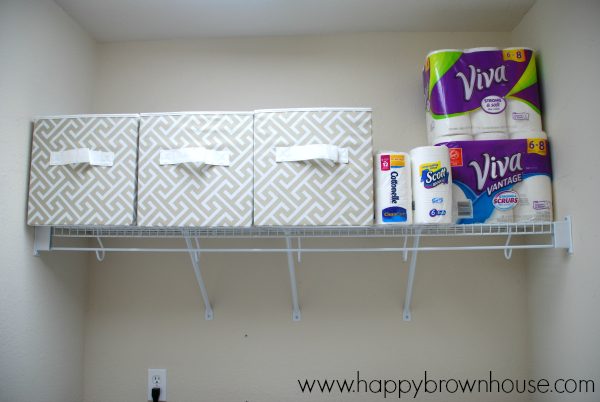 If you’re ready to start your #SpringClean16, head to Walmart and stock up on your cleaning supplies including, the Kimberly-Clark products I used in this post. Which room will you start with first?